Harrahs Buffet is one of the best buffets in Las Vegas. 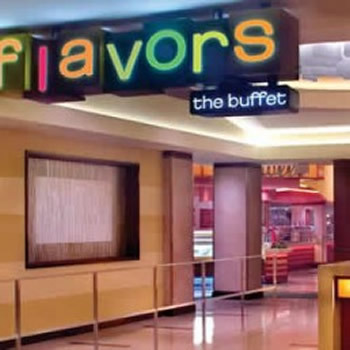 Flavors, the Buffet at Harrah’s in Las Vegas offers a huge selection of foods at a fantastic value, all presented in a comfortable and clean environment. You’ll be able to sample many different flavors from all over the globe at this fantastic Vegas buffet. You can sample fresh seafood items like delectable crab legs and peeled shrimp, Southwestern selections and fresh cuts of juicy Prime Rib which are complimented by delicious sides like garlic mashed potatoes. Like any good buffet, you can find a fantastic selection of international cuisines at Flavors. Sample Italian fare, like pizzas and casseroles baked in a wood burning oven or have a chef make pasta the way you want it at the pasta tossing station. If you’re looking for Asian cuisine, try hand rolled sushi selections, Maki Rolls or steaming wonton soup. And don’t miss the Brazillian BBQ (or Churasco) station, where you can try a plate of spicy fire-roasted rotisserie chicken. Save room for dessert, as the buffet features homemade sorbet, ice cream, gelato and a huge selection of delectable pastries for those with a sweet tooth. If you’re looking for a Las Vegas buffet with a huge selection of foods from all over the world at a great value, then you might want to head over to Harrah’s to sample the Flavors.